Sting may be celebrating 25 years in music, but the one-time "Police" frontman hates to look back, he told AFP on the final stretch of a year-long tour that wraps up in Asia in December. "I'm not a very nostalgic person. It's just not in my nature," the singer said in an email interview, before arriving in France this week for the latest leg in the "Back to Bass" tour, launched in 2011. Once the tour is over - the last programmed date is in Jakarta on December 15, final stop after half a dozen Asian gigs - Sting intends to move on. "After this tour, I'm switching gears a bit and will continue work on the play I'm writing," said the singer, born Gordon Sumner, who just turned 61. Based in his native city of Newcastle in northern England, and entitled "The Last Ship", the musical work tells the story of shipyard workers who decide to build their own vessel. "We're in the very early stages, but I've found myself very inspired. I've written a lot of new songs for the project. It's completely uncharted territory for me and it's quite exciting." 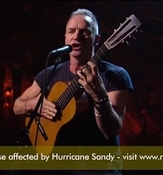 These last few years, Sting had shot away from The Police's 1980s repertoire, with the 2006 "Songs of the Labyrinth" featuring an Elizabethan lute, and the 2009 "If On A Winter's Night" inspired by the chilly mornings of his childhood. "Throughout the process of compiling material for the (25 Years) box set, I was sort of forced to look back, when my instinct is always to move forward." Even in Police classics like "Englishman in New York," "Message in a Bottle" or "Roxanne" - "which I've probably sung thousands of times" - Sting said there was "always something new to be found." "It is my job to sing these songs every night with the passion and same sense of discovery as when I wrote them." 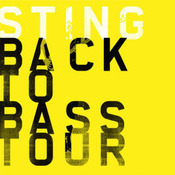 It is very very disappointing and sad that he is not coming to Japan in his Back to Bass tour this time. We are recovering from the disaster at Fulushima and we need the power of HIS music... Hope we can see him sometime soon again in Japan. We love you, Sting.